"The Single Best Bite of Food in Town." Gluten-Free option: Request no bread on plate. Gluten-Free option: Request no horseradish or cocktail sauce. Fried Louisiana oysters, creamed spinach, bacon, bordelaise sauce and extra cheese topped on toasted French bread medallions. *There may be a risk associated with consuming raw shellfish as is the case with other raw protein products. If you suffer from chronic illness of the liver, stomach or blood or have other immune disorders, you should eat these products fully cooked. Denotes a gluten-free menu item. While Drago's offers a gluten-free menu as a courtesy to our guests, all of our food is prepared in the same kitchens and our restaurants are unable to guarantee that any item can be completely gluten-free. Sushi-grade raw tuna with a wasabi dressing, topped with our Cajun aioli. Fried shrimp sautéed with peanuts and a spicy red pepper aioli. Jumbo lump crabmeat served au gratin-style with Drago’s signature Zapp’s potato chips. Jumbo Gulf shrimp seasoned with fresh herbs and spices, served the "New Orleans Way" with French bread. Generous chunks of sweet Maine lobster meat and spiral pasta blended with a creamy cheddar cheese sauce. Lightly topped with garlic herbed bread crumbs. One of Drago’s favorites! A blend of cheeses and sautéed spinach, served with tortilla chips. Fried eggplant topped with freshly grated cheeses and served with our Seduction marinara sauce. Alligator tail meat seasoned and fried, served with a remoulade sauce. Gluten-Free option: Request blackened. No remoulade sauce. Freshly cut and lightly fried. Blackened alligator tail meat with arugula, pico de gallo, and Cajun aioli in soft taco shells. Half charbroiled Maine lobster, a petit filet, and blackened shrimp with a light Cajun cream sauce, served with corn maque choux and potatoes. Gluten-Free option: Request no sauce or corn, substitute sautéed spinach. Jumbo Gulf shrimp baked with a spicy Cajun sausage, served with corn maque choux. Slices of fried eggplant with sautéed shrimp stacked between each layer, then topped with a tomato cream sauce. Oysters and Tasso sautéed in a cream reduction sauce with garlic, butter and herbs, served over angel hair pasta. Jumbo Gulf shrimp, lightly seasoned and grilled, with choice of Creole sauce or Alfredo sauce tossed with angel hair pasta. Garnished with fresh. Jumbo Gulf shrimp and Tasso in a spicy butter cream sauce, served with grits and topped with fresh rosemary. Shrimp and crabmeat cooked in a delicate cream sauce with angel hair pasta and sprinkled with fresh Parmesan and Romano cheeses. Chicken, pork and Andouille sausage in a hearty Cajun sauce tossed with spiral pasta, derived from the traditional jambalaya. Shrimp or oysters sautéed with sun-dried tomatoes, pine nuts and onions, deglazed with tequila and seasoned to perfection. Served with a grilled portabella mushroom. Gluten-Free option: Request no portabella mushroom, no pasta, substitute rice. Duck breast blackened rare, served over spiral pasta with oysters and cream sauce. Mounds of our freshly shucked oysters on top of French fries. Fresh jumbo shrimp, stacked on a pile of French fries. Catfish strips lightly battered and fried, served with French fries. Crisp romaine tossed with a light vinaigrette and Italian cheese-style dressing, then topped with jumbo lump crabmeat. Gluten-Free option: Request no dressing. Sliced tuna (very rare) drizzled with Cajun aioli, served over avocado, tomato and mixed greens tossed in a soy vinaigrette. Gluten-Free option: Request no aioli, no dressing. De-shelled Maine lobster, with your choice of mixed greens or spinach. Jumbo Gulf shrimp, seasoned and grilled, with cucumbers, tomatoes and fresh mixed greens, served with dressing of your choice. Fried shrimp or chicken, Buffalo-style, served over mixed greens tossed with bleu cheese dressing. Served with either chicken or shrimp. Wedge of iceberg lettuce topped with our creamy bleu cheese dressing, chopped bacon and extra bleu cheese crumbles. Fresh assorted greens tossed with candied walnuts, cranberries, bleu cheese, and a cane vinaigrette. Gluten-Free option: Request no bleu cheese, no dressing. Chicken, bacon, bleu cheese crumbles, cheddar cheese, chopped hard-boiled egg and fresh mixed greens, served with dressing of your choice. Gluten-Free option: Request no bleu cheese. For salads, please request oil & vinegar with lemon, as none of Drago's salad dressings are gluten-free. Add grilled chicken or grilled shrimp to any salad. Ask your server for available sizes. 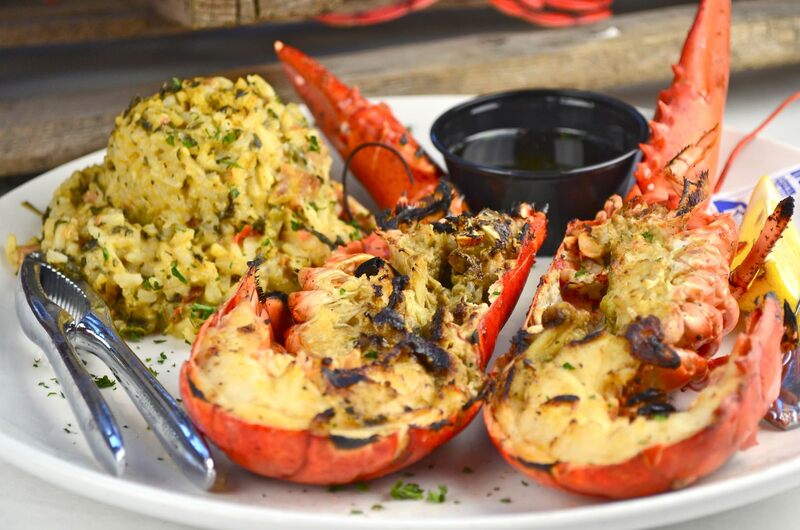 A Maine lobster charbroiled with garlic butter. Served with potatoes. A Maine lobster stuffed with fresh sautéed shrimp and mushrooms in a delicate cream sauce over angel hair pasta. A Maine lobster stuffed with fresh sautéed oysters and mushrooms in a delicate cream sauce over angel hair pasta. Served with collard greens and potatoes. Gluten-Free option: Request sautéed fresh spinach and potatoes. Baked with Cajun seasoning, served with collard greens and potatoes. Baked with tomatoes, capers and herbs, served with sautéed fresh spinach and potatoes. Lightly seasoned and seared (very rare) then drizzled with a Cajun aioli. Served with asparagus and potatoes. Gluten-Free option: Request no aioli. Catfish fillet coated with blackened seasoning and seared. Served with collard greens and potatoes. Gluten-Free option: Request spinach and potatoes. Seasoned and baked, served with baby arugula and potatoes. Gluten-Free option: Substitute oil and vinegar for dressing. Seared catfish served with a Louisiana brown sauce and grits. Red beans seasoned with sausage and Tasso. Served with rice and Andouille sausage. Louisiana-style red sauce sautéed with the "Holy Trinity." Served with rice. A New Orleans classic! Pulled tender veal with caramelized onions in a rich gravy served with grits. A very tender, slow-cooked short rib served with potatoes and gravy. A slightly spicy and delicious Cajun stew made with vegetables and a dark roux. Served with rice. Seasonal substitute shrimp. Two petit filets served with collard greens and potatoes. Gluten-Free option: Request no sauce, no collard greens, substitute sautéed spinach. A cheese-crusted chicken breast, sautéed and served over angel hair pasta with our Seduction marinara sauce. Gluten-Free option: Request no pasta, substitute potatoes or rice. Please request no aioli for the Charbroiled Corn on the Cob. Served with French fries and a vegetable. Served with potatoes and a vegetable. Cheese, onion and hickory smoked sauce. Served with French fries. Cheese, lettuce, tomato, pickle and onion. Served with French fries. Enjoy our full menu from the comfort of your own home. © 2019 Drago's Seafood Restaurant. All Rights Reserved.